I have few basic doubts. Is open("/dev/kvm") getting called from vcpu thread or io thread ? How does vcpu thread give illusion of a cpu ? Does it have to do with maintaining cpu context before context switch ? or does it require VT hardware support ? 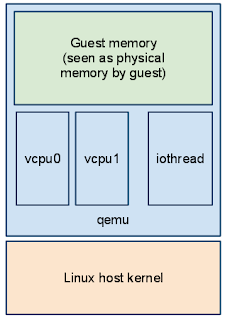 > Is open("/dev/kvm") getting called from vcpu thread or io thread ? It is called from the main thread when QEMU starts up. Remember each vcpu has its own file descriptor, so open("/dev/kvm") is the global file descriptor for the VM and not specific to a vcpu. > How does vcpu thread give illusion of a cpu ? Does it have to do with maintaining cpu context before context switch ? or does it require VT hardware support ? Yes, the kvm.ko ioctl(2) API allows the vcpu register state to be manipulated. 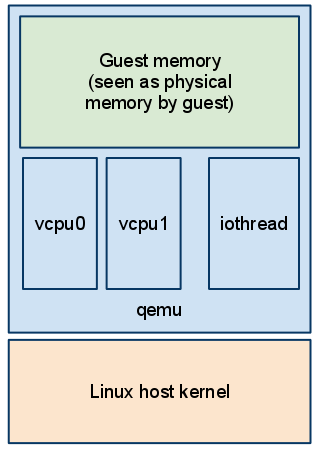 QEMU initializes the vcpu on reset just like a physical CPU has an initial register state when the machine is turned on. Hardware support is required for KVM. On Intel CPUs the instruction set extension is called VMX (the feature is marketed as "VT"). On AMD CPUs the instruction set extension is called SVM. They are not compatible and therefore kvm.ko has 2 separate codepaths for Intel and AMD. Hey Stefan. Thank you for a wonderful post. I was wondering if there is anyway for the hypervisor and the guest to communicate with each other directly. I am trying to establish a direct bi-directional communication channel between the hypervisor and the guest. Do you know of any approaches or do you have any pointers to solve this problem. It depends on what sort of communication you need. virtio-serial can be used for arbitrary guest/host communication. The QEMU guest agent (qga) builds on top of virtio-serial and introduces a JSON RPC API. It allows the host to invoke a set of commands inside the guest (to query the primary IP address, prepare applications for backup, etc). 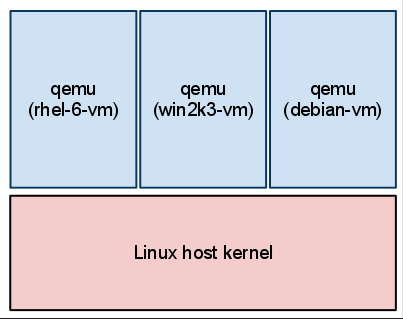 Please discuss on qemu-devel@nongnu.org if you want to go into more detail. 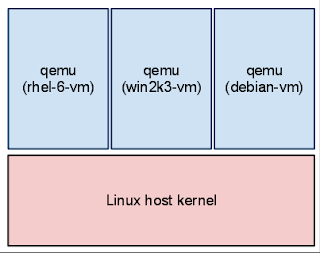 of 2013, is QEMU still needed as part of KVM to run a guest OS? QEMU, so I wonder has KVM integrated everything into KVM? A question: Is there any reason why KVM still emulates X86 instructions inside kernel, while it can just run them directly on bare metal? I understand that KVM must emulate missing instructions, but in kernel it even models general instructions PUSH, POP, etc... Which confuses me a lot. Emulation is used in a couple of different cases: older CPUs don't support real-mode in VMX so it must be emulated, a faulting instruction may need emulation if it accesses an MMIO address, etc. That said, I'm not an expert on kvm.ko internals so try asking on kvm@vger.kernel.org if this answer isn't enough. Thanks for your reply. I will post to the list, but just 1 more question: you said "... a faulting instruction may need emulation if it accesses an MMIO address". I dont get why faulting instruction must be emulated in this case?? Can you elaborate a bit? The guest is storing a value to a memory-mapped I/O address. The CPU cannot execute that in VMX mode since I/O device emulation is performed in software. So my guess is that kvm.ko will emulate the instruction - but check the KVM source code or Intel Architecture Manual to be sure how it works. @Anonymous: did you find a satisfactory answer somewhere? I'd be also curious to learn it :) Thanks! Thanks for the information, Stephan. I did not find any documentation for developers in Qemu. Consider a scenario where Disk cache (in MM) is used inside virtual machine, if I want a mapping between any disk-cache main memory page and actual physical block of same page. What are the files I will have to look upon, what changes are required, tell me files only. Your question does not make sense to me. Maybe I have misunderstood it. A process inside the guest has memory-mapped data from disk. You want to know the mapping between memory pages and disk blocks. This information is not within QEMU. The guest kernel does the memory management you are interested in. 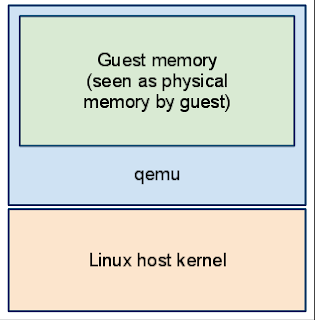 The management of virtual memory is a guest concept, QEMU or physical hardware doesn't know which page in RAM is mapped from disk - the kernel memory management code creates the illusion by mapping/unmapping pages on-demand. Host makes a image file, and guest think it as a file system or may be disk. Suppose guest want to access block no. 10, from any file, from any file system. But actually the request is converted to file access from a image file at the host level. If you can help me, which is the function or file(s) which convert request virtual to physical for I/O. Forget memory this time. I can show you some example..
hw/block/virtio-blk.c:virtio_blk_handle_read() performs a read request on behalf of the guest. The key function is bdrv_aio_readv(), which reads sectors from the disk image. How vm network packets gets dropped (or transfer) to data-link layer of physical machine. Which part of kvm, kvm-kmod or qemu source code is responsible for this functionality? Please ask general technical questions on the QEMU mailing list: qemu-devel@nongnu.org. I believe it is possible to emulate an ARM core on x86, but you have mentioned... "today that means x86-on-x86 virtualization only". Can you please elaborate? This section is about hardware virtualization support, which makes it possible to "safely execute guest code directly on the host CPU". The key word is "directly" because KVM gives the CPU the address of some guest code and the CPU executes it without any translation. Emulation does not execute guest code directly on the host CPU. It either uses an interpreter or a just-in-time compiler to translate guest code to native code. Emulation is slower than virtualization because of this extra software layer. Emulation does not execute guest code directly on the host CPU. It either uses an interpreter or a just-in-time compiler to translate guest code to native code. -> Could it be possible that guest code is arm code and native code is x86 code ? Thanks. downriver119: Yes, QEMU can run ARM guest code on an x86 host. "QEMU can run ARM guest code on an x86 host" means that QEMU run ARM guest code by emulating directly and not with the help of KVM, right ? Thanks a lot. Yes, it requires emulation and not KVM. KVM only supports the guest and host being the same architecture. How to monitor guest memory usage through libvirt or qemu-kvm? Please send general questions about libvirt to libvirt-users@redhat.com or about QEMU to qemu-devel@nongnu.org. Can you explain flow on an I/O access from an application running on Guest OS? There are multiple code paths depending on whether you are using KVM or TCG, MMIO vs PIO, ioeventfd on or off. The basic flow is that a guest memory or I/O read/write access traps into kvm.ko. kvm.ko returns from ioctl(KVM_RUN) with a return code that QEMU handles. QEMU finds the emulated device responsible for the memory address and invokes its handler function. When the device's handler function completes QEMU re-enters the guest using ioctl(KVM_RUN). What do you mean by emulate- QEMU doesn't really access the physical device in real? ?What if the I/O read/write is done to a device which physically exists? Does KVM perform I/O action on the physical device ?? How does the QEMU emulation work virtio ?? Most devices are emulated. Some devices can be passed through. Thanks for sharing those, I have gone through these and yet confused. Let me pick up one example to point out the confusion. Let say, I want to write something on to a physical device attached (Eg:NIC) from an application running on Guest OS, It would execute OUT instruction and get trapped into hypervisor (if guest is paravirtualized, it may do a hypercall), KVM gets it and does KVM write to NIC or give it to QEMU (QEMU emulates and then writes it to NIC) ?? Second part is, in the whole process, where is Virtio getting into action? Your questions are general and it's hard to give a useful answer because many configurations are possible. You'll need to research your specific configuration if you want to know exactly what is happening. The guest sees an emulated NIC unless PCI passthrough is used. kvm.ko and QEMU do not write directly to a physical NIC when emulating a NIC. Instead they hand packets to the Linux network stack (e.g. tap device) which sends them. virtio is a family of emulated devices (networking, storage, etc) designed for virtualization. Some optimizations are made but mostly it's the same as emulating "real" devices. First, thank you for your various blogs regarding the qemu/virtio/kvm. I want to understand how kvm.ko can trap the virtqueue's kick (iowrite16 in vp_notify of virtio_pci). However, I could not find the code in virt/kvm/ that do this kind of registration. Is it in kvm_arch_init_vm? arch/x86/kvm/x86.c:vcpu_mmio_write() calls kvm_io_bus_write(). The ioeventfd is registered as a KVM I/O bus device from virt/kvm/eventfd.c:kvm_assign_ioeventfd_idx() and the ioeventfd's ioeventfd_write() callback will be invoked. Thank you very much. Is my trace correct? Sorry I am pretty new to this. Yes this shows how the ioeventfd is signaled when the guest kicks the host. Note that some hardware registers on some devices don't use ioeventfd and instead ioctl(KVM_RUN) returns with a PIO or MMIO exit reason (see KVM API docs). To add new functionality of booting from Virtual USB in qemu what should we do?